I can do this, right? I mean it’s just eight weeks. This was what I was thinking when I signed up to participate in a paleo challenge with some of my fellow crossfitters a few weeks ago: eight weeks is doable. I was up for a challenge; I have never followed a paleo diet before but I had heard of it. And this has been my year of challenging myself and trying new things, so after a little time considering it and encouragement from friends I decided to give it a try. How bad could eight weeks be? Today, September 22nd, marks the first day of week 2. I did it, I made it through week 1! In celebration of finishing week 1 I’ve decided that once a week I’ll post an update and share my paleo challenge experience with all of you. Ok, today is the day I begin my challenge! Well, I mean, it really started yesterday when I went food shopping and tried to meal prep for the first time. Aside from some big frustration in the salad dressing aisle at the grocery store when I realized that pretty much all salad dressing is NOT paleo unless I make a version myself and a few texts to one of my crossfit coaches with some paleo questions (shoutout to Brittney! ), I made it through my prep day. Today was HARD. I have been hungry, actually ravenous all day long, but I stuck with it. Meal prep helped a lot and I’m really glad that I took the time to do it on Sunday. Some chatting at the box gave me some good pointers such as EAT MORE. Apparently I’m not eating enough, which easily explains why I’m so hungry. My friend Susan offered to lend me some paleo cookbooks and make me paleo buffalo chicken dip and I’m so excited about it! I miss coffee. A good cup of coffee with a little sugar and some cream. Ok, a lot of cream. I light my coffee light. Coffee with a little almond milk is too watery and now my morning is off to a rough start. Second challenge of the day – a work meeting that ends up being a lunch meeting. I walk in the door and smell pizza. Pizza is my kryptonite. I take a deep breath and tell myself that I have scheduled cheat meals this week and I will only eat the paleo lunch I brought with me. You know what? I made it through that meeting without eating any pizza! It was HARD, but I did it. Yay, me! I make it through the rest of the day thinking about paleo buffalo chicken dip. Susan is right – this stuff is TO DIE FOR! I end the day perusing through some of her cookbooks and planning. Did you know paleo dessert exists?! I might make it through these eight weeks after all! I have my first cheat meal today (or is it a cheat snack since I didn’t have a full meal?) and I feel slightly guilty about it. I decided I wouldn’t stop my food writing during my eight week challenge, so here and there cheat meals will happen. And to be honest, they’re giving me something to look forward to. Tonight I have just a little poutine at Washington Prime – it’s AHmazing and irresistable (read more here about my visit to Washington Prime)! A few small bites were worth it and now I feel back on track. One of Susan’s cookbooks has a coffee smoothie recipe and my morning is off to an excellent start! Today feels easier and I feel FANTASTIC. I promised myself I’d only step on the scale on the first and last days, but my work pants are surprisingly loose already so I step on today. Maybe once a week weigh in will help motivate me on hard days? Just shy of five pounds already – WOAH! Maybe I can fight off that cake craving I’ve been having! I’m on a mission today to find all the uncommon ingredients I need to try a paleo baking recipe. Almond flour, coconut flour, coconut sugar…did you know these things existed because I sure didn’t! I’m determined to try a raspberry lemon muffin recipe because my sweet tooth cravings have begun. Guess where I find almost all of these weird, or rather unique ingredients? Target! THANK YOU, Target xoxo! I begin baking at nine o’clock at night because, well, I have to admit I’m feeling a little desperate. Muffin success – stay tuned for recipes next week! Today was a wakeup call that I really am not eating enough (even though I thought I was and have increased my intake) especially when I spend most of the morning battling being dizzy and miss my usual Saturday crossfit class. So the question now is – how much food should I be eating? Do you just fill up as long as it’s paleo approved? I have to figure this out. Two slices of pizza with my husband and friends for dinner happened and that pizza tasted even better than it normally would! On Sundays I love brunch – waffles, pancakes…you get the idea. So I try a banana waffle recipe out of The Paleo Kitchen by Juli Bauer and they are really delicious! Paleo waffles are heavier and I assume I’ll eat two, but I end up filling up after one with some fresh fruit on top. I freeze the rest of the batch so I have waffles throughout week 2. I spend part of my Sunday meal prepping and I actually feel like I’m starting to get the hang of this! On to week 2! Does anyone else out there eat a paleo diet? Do you have any favorite recipes? 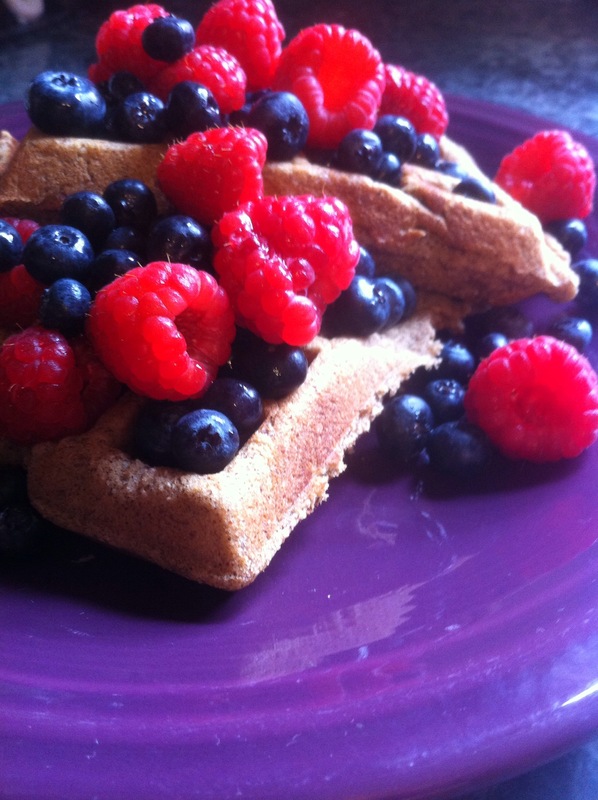 A sneak peak at these delicious paleo banana waffles!